Mustang Elementary’s 2016-2017 Teacher of the Year is media specialist Tanya Bernhardt. Her history with the school is long. She went to elementary school there herself, did her student teaching there and ended up staying. Getting back to Mustang Elementary to teach, though, took a little time. After she graduated from Mustang High School, Bernhardt got a job as an apartment leasing agent. By the time she was 25, the apartments were sold and Bernhardt had to start over. Ready for a more stable career, she took an interest inventory test. Teaching and nursing both came up. Bernhardt earned her EMT certification and rode the ambulance. At 26, Bernhardt returned to college, earning a bachelor’s and then a master’s of education in instructional media from the University of Central Oklahoma. Her children attended Mustang Elementary and her student teaching was there as well. 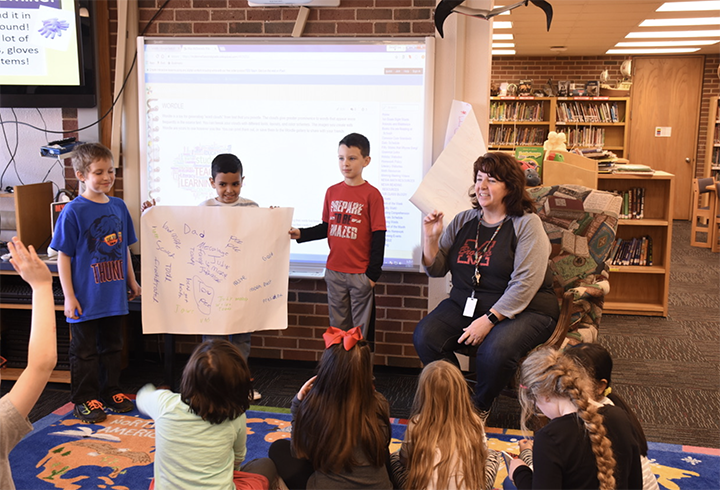 The principal, Ann Morgan, who had been a fifth grade teacher in the building when Bernhardt was an elementary student, hired her to teach kindergarten. Bernhardt was assigned the exact room where she went through her own kindergarten year. Bernhardt would always assign a writing sample on the first day of school. For kindergarten they would try to write their name. When she taught second grade, she would ask them to write about their favorite part of school. They would do the same exercise on the last day. She remembers one little boy she had in kindergarten. The next year he moved on to first grade, but his mother showed up in Bernhardt’s classroom that September. He did not want to go back to school. Bernhardt taught kindergarten for four years, second grade for one year and transitional first for four years. She’s been the media director for 11 years. “Reading is so critical. All other subjects will fall into place if you have good reading skills,” she said. Her role as a media director extends far beyond checking out books. Bernhardt teaches classes every other week. She introduces students to genres and has a book club for first and second graders. Although the internet has become the primary source for gathering information, Bernhardt makes sure the students understand how to use printed material to find answers. Bernhardt teaches computer and also leads a student broadcast team. They have a small studio where kids run the cameras and others, the morning news anchors, read the announcements over the school’s television system. When Bernhardt started working in the library at Mustang Elementary, the average publication year of the collection was 1972. The collection was so outdated, one volume talked about how someday a man would walk on the moon. One printed in the 1960s included information about how towels would be obsolete in the year 2000 because the world would have full-body dryers. Bernhardt has been working at Mustang Elementary for 21 years. She still enjoys walking through the door to work every day. Bernhardt is one of 14 site Teachers of the Year for Mustang Public Schools. The district Teacher of the Year will be announced at a special banquet in March.